Back in March we did an interview with Eris Koleszar for Speaking Of Happy and little did we know how big she would become in less than a month! Eris is an outspoken advocate for the trangender community and recently took a powerful stand against anti-trans descrimination online via her selfie campaign! She has not only thrust herself into the public eye but she has also taken on activating allies in her quest to create safe bathroom spaces for Transgender people in Omaha! After an online dispute started by a post from a local bar owner Eris has been personally advocating on behalf of the trans com munity online and on television! We knew from the moment we met her last year that we had to have her on Speaking Of Happy and thank goodness we acted fast before her dance card filled up! Eris is a amazing human being who is articulate and funny and just all around wonderful to spend time with. 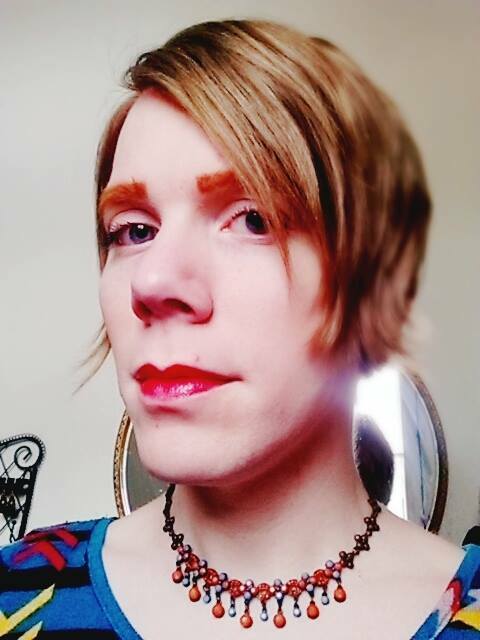 She is a force to be reconned with online as she takes on some of the most vile anti-trans people in Omaha but also is activitating local allies with her selfie campaign! She has been going to local venues and asking allies to take selfies with her and post them to their social media with the hashtags #shebelongs #shejustwantstopee #transwomenarewomen and educating people about the hateful anti-trans legislation showing up across the nation. She is defeating stereotypes one selfie at a time and doing it with great class! This is our interview which was conducted last March and originally aired on RadiOmaha. If you do not see the player then click HERE and listen on PodOmatic. This entry was posted in Radio Show and tagged in Caitlyn Jenner, Friends, Omaha, Rigatuso, transgender.